As thousands of protesters took to Parisian streets in demonstrations this week against the rising Palestinian death toll in Israeli military operations, French authorities reportedly imposed a full ban on pro-Palestinian marches in several cities. 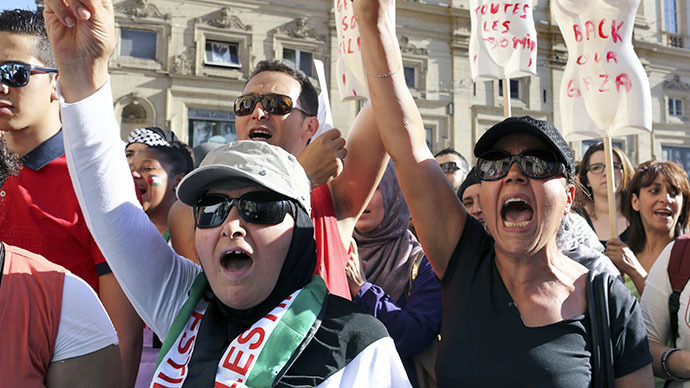 The ban comes at a time when Jewish-Muslim tensions in the country have reached their peak. 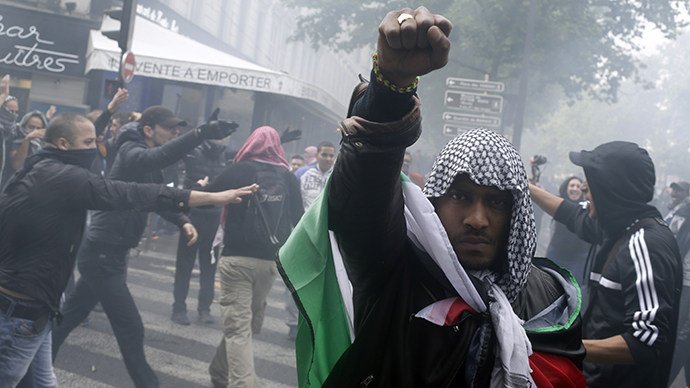 France is already known for such emotions spilling over into violence. Among them was last Sunday’s rally, which started out peacefully, but ended in stone-throwing and sporadic violence, with some Jews holed up inside two synagogues, as police quickly upped the security around Jewish establishments and businesses. There were several injuries. Another event was planned for Saturday, but was called off due to "the serious risk of disruption of public order that such a protest could engender, in a context of heightened tension," according to an anonymous police source speaking to the AP. 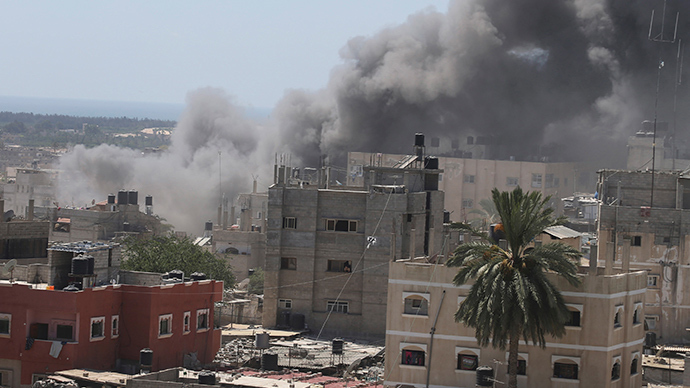 The world’s biggest concentration of both Jewish and Muslim communities continues to stand on the brink of chaos that mirrors the Gaza-Israel standoff. According to Radio France Internationale, the ban on rallies was proposed by France’s Interior Minister Bernard Cazeneuve. He called on officials to take the situation into their own hands after the synagogue incident earlier on Sunday. That day’s event included 50 political parties, as well as unions and activist groups, which were to take to the streets in protest in Paris, Lyon, Lille and Toulouse to seek an “immediate end” to Israel’s bombing of Gaza, where the death toll stands at over 200 people. Following the Sunday protest, French Prime Minister Manuel Valls on Monday said the violence is “inadmissible,” adding that "France will never tolerate using violent words or acts to import the Israeli-Palestinian conflict on our soil." According to the AP speaking to Roger Cukierman of France’s Representative Council of the Jewish Institutions, CRIF, militants from the Jewish Defense League also took part in the violence directed back at the pro-Palestinian demonstrators during several recent rallies against Israeli operations. The official denounced the group’s violent methods, which included provoking the other side. He told the agency the current tensions between the two communities are the worst in a decade. France isn’t only trying to calm tensions on home soil. 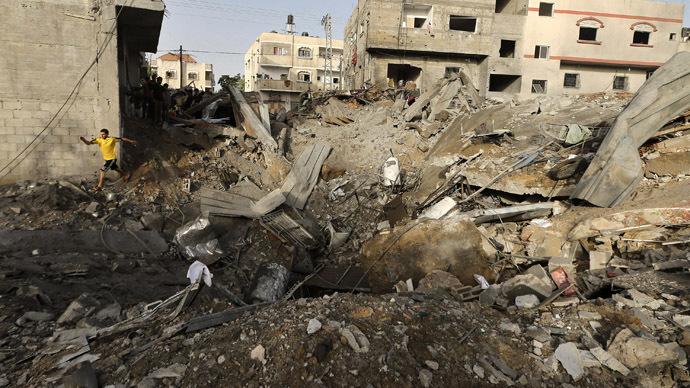 Work is being done to get a ceasefire thousands of miles away in Gaza. The problems at home are compounded by groups of Muslim immigrants arriving to France in search of a better life. When faced with a lack of employment prospects, as well as discrimination, they have the propensity to join up with Islamist radicals to fight Western forces in the Middle East. A similar process is going on with French Jews: they leave en masse for Israel. A prominent Nazi hunter speaking at a recent remembrance ceremony for the Jewish deportees explained how this move by the Jews is in line with what they’ve been taught to do historically. "The Jewish population is worried because they are finding themselves cornered on the one hand by the right, the extreme right, which is gaining electoral support, and is still anti-Semitic in its ideology and in its ranks, and on the other hand, by pro-Palestinian forces, by the extreme left, by disaffected youth from suburban housing projects, and by the Muslim population in general," Serge Klarsfeld said at the service. "History tells us that when there is an anti-Jewish movement we cannot control, the best thing to do is to move to another country," he added. The death toll from the Israeli military operation has now climbed past 200 Palestinians, around 70 percent of which are civilians and 30 percent are children, says the UN Office for the Coordination of Humanitarian Affairs. Fifty-two people were killed on Saturday alone. 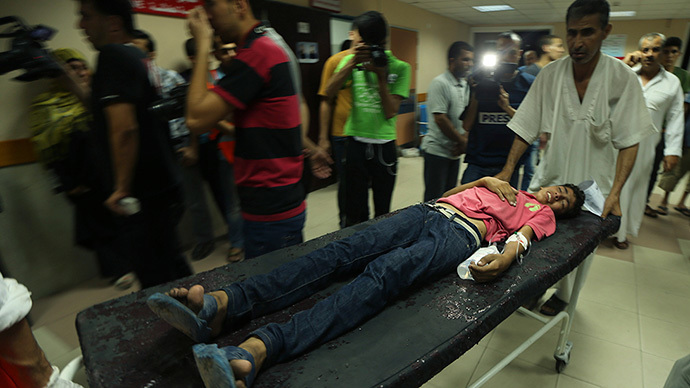 By contrast, the Palestinian offensive, which included 1,200 rockets, took the life of one Israeli.